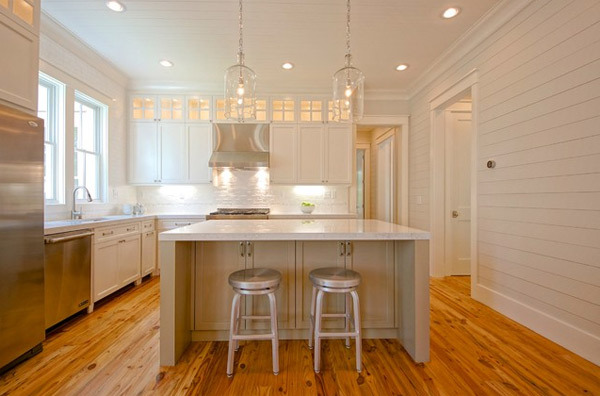 White kitchens convey a sense of glamor, of cleanliness and hope. In these pristine spaces where food is cooked with love, we spend time constructing relationships with our family and friends and we take care of the loved ones by providing a serene atmosphere. Flooded with natural light during the day and recreated under artificial light at night, the white balance creates a fairytale setting. Envisioned by London-based Increation studio, this highly contemporary kitchen has an intelligent design that makes everything easier and has a powerful visual appeal. 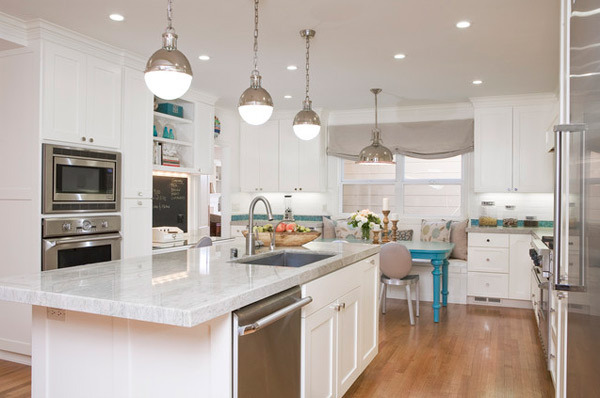 The dreamy blue backsplash adds an interesting twist to the otherwise pristine kitchen. Undulating lines border the space reserved for cooking, creating a modern effect that moderates the straight design lines used to communicate simplicity. 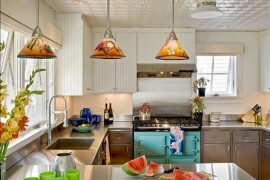 Colorful details are always a great solutions for white kitchens with no personality. Adding vivid colors here and there breaks the monotony, adding another dimension to the overall effect. 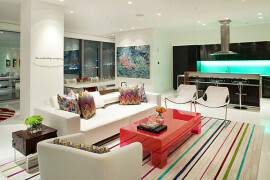 Exemplified in the photo below, a white kitchen with vividly colored accents sets a youthful mood. 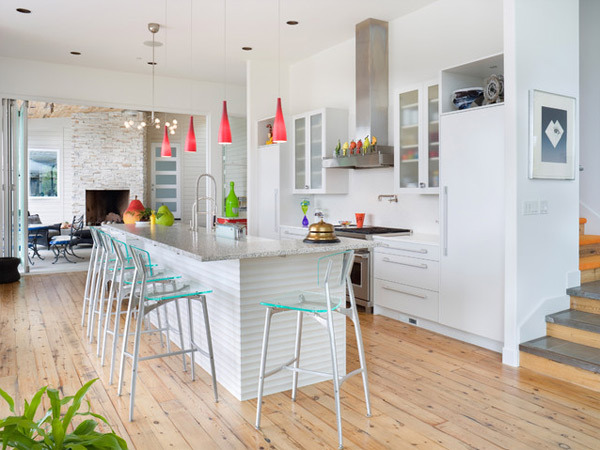 Designed by Alan Mascord Design Associates Inc. as part of the Brunstrom Residence, the light filled kitchen surprises the playfulness associated with a bold use of color. 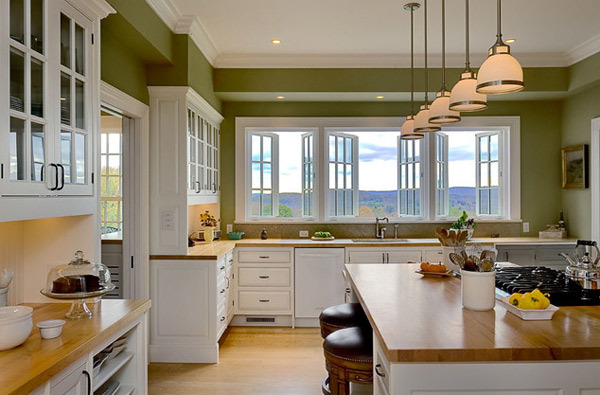 Traditional kitchens exploring the vast design territory encompassed in the potential of white as a main color sometimes surprise us with a very interesting choice of secondary color that can make or break the final result. 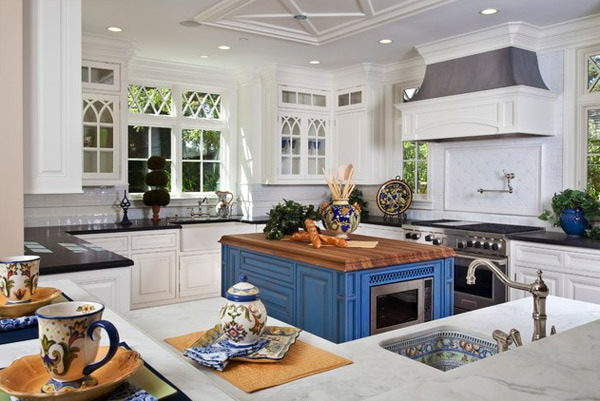 In the case of this spectacular traditional kitchen imagined by Brownhouse Design, the white surroundings were cleverly accentuated by the use of blue and brown, as well as the patterned details like the hand painted sink or elegant housewares. 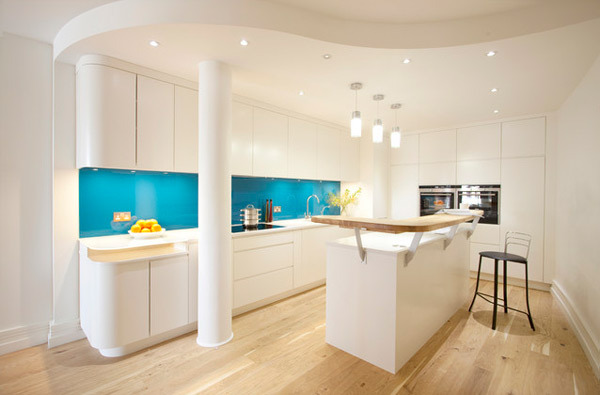 This contemporary kitchen design was carefully imagined to surprise the possibility of creating an edgy space where straight lines meet bold colors. White is the main color used by Amitzi Architects to create a pristine environment and they used geometry to evoke a futuristic hint. 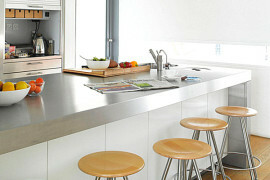 The kitchen island displays a Corian kitchen island and sides with a translucent glass front. 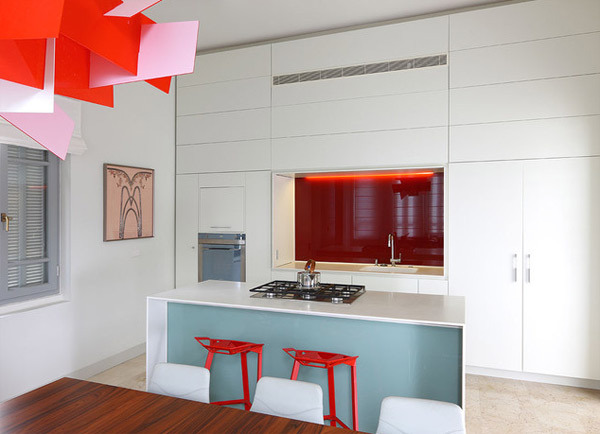 Adding the bright red details like the light, chairs and glass backsplash, architects managed to elevate contemporary kitchen design to a new level. The possibility of creating a place where you enjoy cooking comes with the responsibility of capturing the essence of your family life. When the kitchen displays the necessary design that satisfies your personal needs and wishes, this space becomes that “heart of the home” we hear about. 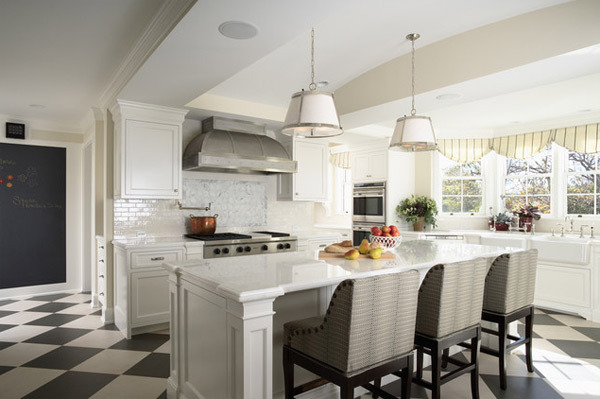 A white kitchen has the potential to create a light atmosphere and this example by Amoroso Design shows that some accent colors are always welcomed in a pristine kitchen. A honey-colored kitchen design from Melissa Lenox Design fabricates a soothing space where everything has its place and food is cooked slow. 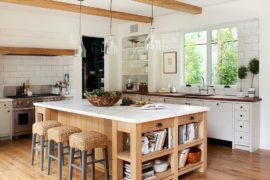 Spacious enough to accommodate a kitchen island but small enough to be cozy, this deliciously designed kitchen seems to be waiting for some decorative details that make it a customized space for a specific family’s needs. Designed by Crisp Architects, this white kitchen embodies a bold edge. 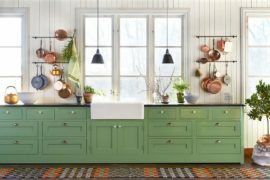 Displaying crisp white cabinets caught in between wooden floors and a white ceiling, this welcoming kitchen was painted with a lovely shade of green, making it look fresh and elegant. This color choice accompanying the white furniture constructs a carefully studied atmosphere where fresh air and natural light flood the space. 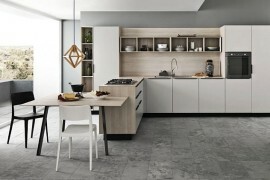 White kitchens can also become part of an extravagant display of preferences. Imagine a place where light, shapes and textures are combined in a customized way. Cook Architectural Design Studio imagined a white kitchen with checkered floors, where the children would play while the parents prepare the food. Isn’t that what love is all about? Designed by Chelsea Atelier Architect, the kitchen seen in the photo below conveys a sense of luxury accentuated by the choice in furniture. Sleek lines construct a welcoming visual appeal, allowing white to take over and create a pristine look. Our last example of a beautiful white kitchen comes from the portfolio of Domb Architects. 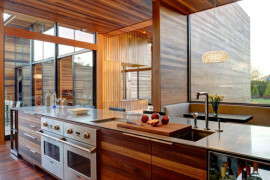 Part of the SL House, this amazing contemporary kitchen is part of an open floor plan, making this cooking space a place for social encounters as well as home cooked meals. It all comes to prove that light-flooded white kitchens steal the show.